In October of 1652, Sarah Wetmore’s husband Thomas was working long hours harvesting the crops they hoped would get their family through the winter. Inside their unfinished house, Sarah was busy cooking over the fire, baking bread, and attending to her other household chores: she had to make soap, spin wool into yarn, and all the while care for her four children, aged one, two, three, and six. In a few days she would give birth again. In 1652 Middletown was just an outpost in the wilderness, a two-year-old settlement that was home to a handful of English Puritan immigrants and still known by its Native-American name, Mattabeseck. It sprawled on both sides of the Connecticut River, and included present-day Middlefield, Cromwell, Portland, and East Hampton. 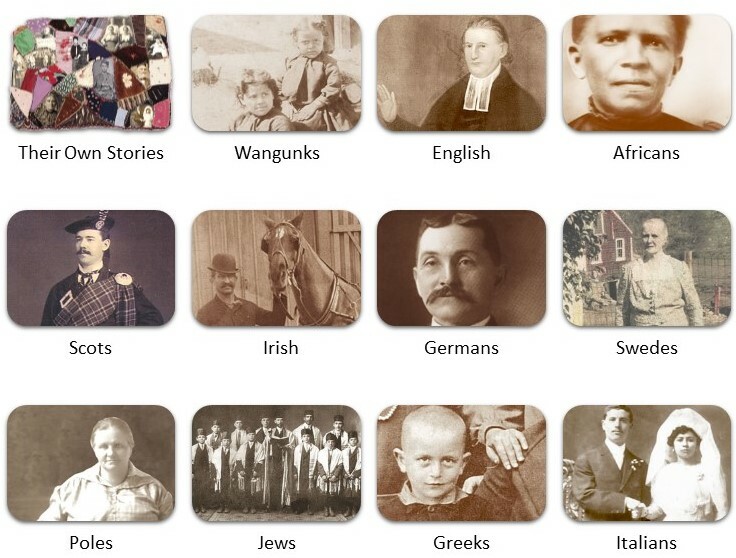 Most of the 52 founding families, or “proprietors,” had been born in England but migrated to the new Mattabeseck settlement from other New England towns. Thomas and Sarah Hall Wetmore had met and married in Hartford in the 1640s. The settlers laid out their main street parallel to the river and divided the town into home lots, pastures, and plowed fields. It was two years before the colonists could build their meetinghouse, but they laid out their burying ground almost immediately. In those early days, survival was precarious and death was a frequent visitor. Puritanism was the only permitted faith, and it dominated every aspect of life. Every household contributed to the cost of the meetinghouse and to the salary of the minister. By law everyone attended Sunday worship, and on the Sabbath unessential work and all forms of recreation were prohibited. At first, every family farmed and kept livestock. Some men also established themselves as millers, stonecutters, weavers, or blacksmiths. By the 1660s, economic activity was stirring more noticeably. There was a shipyard, the first merchants had set up shops and there was even a tavern. But daily life remained difficult and chancy for most. A single poor harvest or a serious injury could be ruinous. And families were large: eight to ten children were common. Disease took an appalling toll on the children; many couples buried more than one. Spouses died frequently, too. Since it was nearly impossible for a single person to manage a farm and family alone, widows and widowers often remarried quickly. Sarah Wetmore bore a total of 12 children, and died just 10 days after delivering her last. A year later Thomas remarried, and lost his second wife to childbirth. After a third marriage, he had fathered a total of 17 children. English colonists continued arriving decade after decade. By the 1790s Middletown was a prosperous port and Connecticut’s most populous town. The strict Puritanism of its first families was gradually superseded as the town’s population swelled with new colonists looking for economic opportunity rather than religious freedom. English settlers did not build their first meetinghouse until 1652, near what is now Main and Spring Streets. Before that time, tradition holds, the colonists held their worship services under the branches of a great elm tree that stood in the north end of town. Mary Hulbert painted this view of the elm tree about 1840. The tree dominated the area around Riverside Cemetery, Middletown’s earliest burying ground. When the elm was taken down in 1842, its rings showed it to be several hundred years old. In this well-worn bible, William Ward recorded the great events–both joyful and devastating–of his family. Left with an infant son, William remarried in just eight months, and soon recorded in this bible the birth of his second son, Thomas. Sadly, it was less than a year later that he had to enter the death of his first child, William, still a toddler. As Puritans, the English settlers turned constantly to the bible, the foundation of their religion. Not all of the early settlers were literate, but those who were had a bible if they could afford one. Connecticut’s General Court ordered that all children be taught to read the bible, and it was likely that William Ward’s seven surviving children learned their catechism from this little volume. For most of the early settlers, it was several years before they were comfortable enough to think about owning more than just the bare necessities. A joined chest like this one bespoke its owners’ prosperity. Though simple in form, its decorative carving indicated an interest in beauty and style, not just function. The artisan who made it probably learned his craft in England, where oak was the wood of choice. And two she has left her husband to cher. In the 1600s, most white women in New England gave birth from eight to ten times. Rarely did all the infants survive: fully a quarter of the children died before reaching adulthood. Without antibiotics, surgery or really any effective medicine, parents were forced to watch helplessly as their little ones died in their arms. The process of giving birth was itself a terrible danger. Nearly one married woman of every four would die from childbirth. Sarah Bacon survived seven of her deliveries, but mourned the deaths of six of her children. In January of 1696, she gave birth an eighth time. Two weeks later, Sarah died, probably from “childbed fever,” a postpartum infection. Her infant, a son named John, survived. Behind a simple gravestone in the Old Farm Hill Cemetery hides a story of scandal among Middletown’s earliest settlers. The Puritans have an enduring reputation as moral and upright people; in many respects their reputation is deserved. Obedience was central to their religion: children were to obey their parents, wives their husbands, and citizens the laws of their government. Yet Puritans were human, no less susceptible to temptation and error than their modern counterparts. A case in point centers on several of Middletown’s earliest settlers. Thomas and Isabel Miller moved here from Rowley, Massachusetts about 1652. On May 6, 1666, the couple’s maid, Sarah Nettleton, gave birth to a son. The father was Thomas Miller. Thomas was about 56 years old; Sarah was 22. 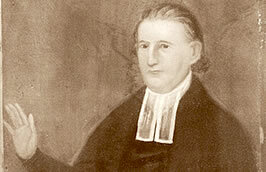 For his sin, Thomas Miller’s home church in Rowley excommunicated him. Finally, in 1674, the convicted adulterer made his only trip back to Massachusetts to express his repentance, and was received back into church membership. Thomas and Sarah Miller had eight children together, the last born after Thomas’s death in 1680, when he was over 70 years old. Some years later, Sarah married John Harris and lived well into her eighties. “I hope in a short time we shall be able to bid Defiance to our Blood thirsty Foes,” wrote Revolutionary War soldier Ebenezer Frothingham, Jr. of Middletown. 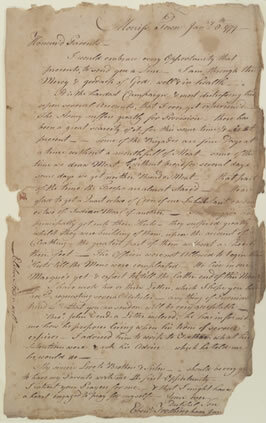 In this letter to his parents in Middletown, 20-year-old Ebenezer wrote poignantly of the American troops’ sufferings in January of 1779. Ann Watkinson was 15 years old when her family immigrated from Lavenham, England to America in 1795. Like many of the English who arrived after the Revolution, the Watkinsons came not in search of religious freedom (as the 17th-century Puritans did) but to find economic prosperity. Ann’s father, Samuel Watkinson, saw Middletown as a thriving, pleasant city, and in 1796 bought a large home on Main Street. The Watkinsons joined a small circle of other well-to-do English families here, and the young people filled their social lives with picnics, sailing excursions, sleigh rides, dinner parties and dances. The daughters of these English families received educations that included the “gentle arts” of needlework and watercolor painting. Ann painted this view of Middletown from across the Connecticut River in the early 19th century.